I have so many purses, tote bags, big ones, small ones, new ones, old ones – yet I only use about 4 on a regular basis. I have three in rotation now depending on the situation. A Vera Bradley crossbody for when I am solo, a Thirty One Cindy Tote for when I am out with the kid and a Dakine Anya bag for work. I keep them all stocked with the necessities and just move my wallet. 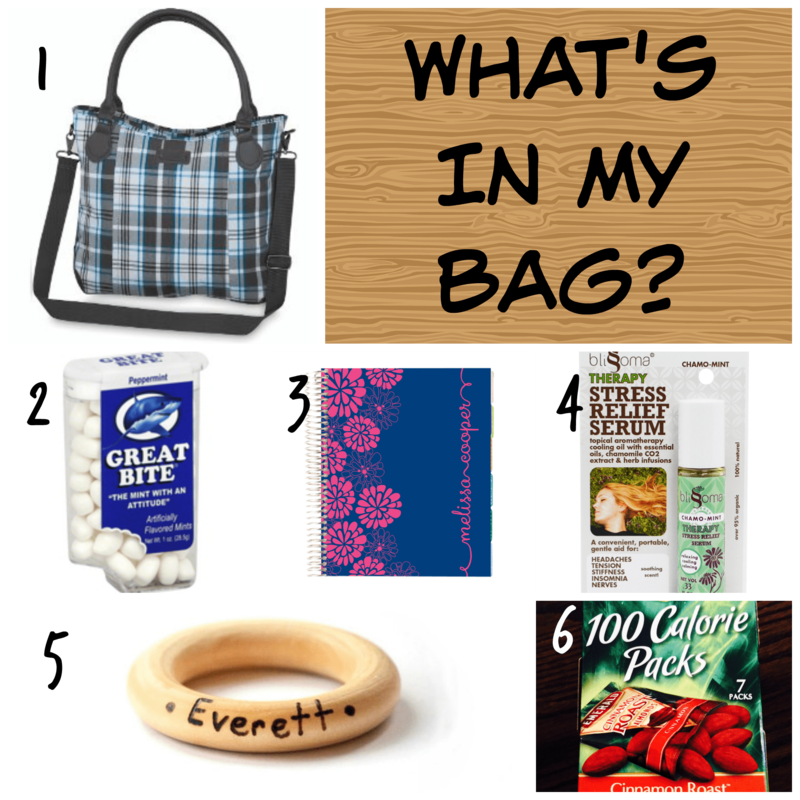 I did a blog post awhile back about what’s in my diaper bag a la US Weekly style, so I was excited when DC Ladies asked bloggers what is in their bag. 1. Dakine Anya Tote: This bag rocks. It is made by an active outdoor company, so it is really durable and the print is ‘calm’ enough for a professional. I also like the multi-strap option – I can do a cross-body messenger style, or use the shoulder straps. 2. Great Bites Mints: These are my mints of choice because of the fun packaging. Plus one will kill bad breath for hours. You’ve been warned! 3. Erin Condren Life Planner: I am in love with this massive life planner. I can’t go to work without it even if I don’t have to check it daily. It’s pricey, but worth it for what I need. Stay tuned for a review in a few weeks! 4. Blissoma Stress Relief Serum: Remember HeadOn? I was obsessed with that stuff as a chronic headache sufferer. When I got pregnant and couldn’t take Advil Migraine we discovered HeadOn was discontinued. S. did some research and ordered me some of this magic. It zaps my headaches, smells amazing and is organic. It goes everywhere with me. 5. Wooden Teether: Last Christmas we got Mike a wooden teething ring with his name on it, because why the heck not. I can honestly say he never used it, but it goes with me in my bags. I am not sure why, but it is comforting to have something of his with me during the day. 6. Emerald Cinnamon Almonds: We are back on the low-carb eating train so almonds are a necessity. I pretty much have them stashed everywhere and LOVE the cinnamon variety. It gives me a sweet taste while keeping me on track.